Following its legacy as a path breaker Naresh i Technologies is offering Online Software Training using its vast Technology Expertise and Training Delivery Methodology for the benefit of the student community in transforming their dreams from a wandering generality to specific reality.Our sole maxim in introducing Online Software Training sessions to cater the training requirements of the Software Aspirants who cannot attend Classroom Training conducted at our Office Locations in Hyderabad and Chennai due to various reasons. We offer two streams of content for Online Training in ALL Courses: For experienced IT professionals – aimed to update knowledge of the existing IT professionals interested to obtain a knack of latest developments in technology. 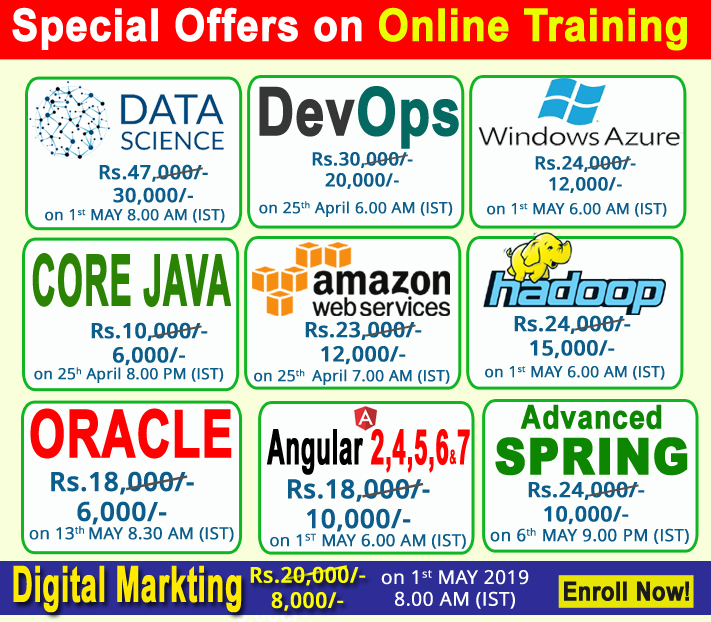 For freshers – intended to teach the required skills to the freshers, wherein the focus shall begin with building a strong understanding of the basics of technology and end with complete guidance on its latest trends. Online training is known to be called as CBT (Computer-based Training), IBT (Internet-based training), WBT (Web-based training), eLearning across the globe. Online Training is a Software-based teaching program installed on a computer network or a computer. It is a procedure of delivering training through an electronic medium or internet without the presence of an instructor or trainer. Are you Located in any of these Locations and Looking for Online Courses ?